Rookery, Traci Brimhall’s smart, sensual debut and the recipient of the Crab Orchard Series in Poetry’s 2009 First Book Award, opens with an epigraph from Emily Dickinson: “Split the Lark—and you’ll find the Music.” If we read this as an imperative to find the muse in birdsong, it stands in useful contrast to the preface poem, “Prayer for Deeper Water.” In that poem, a man attributes his hatred of women to those who do not recognize “the frightened wingless birds” singing within their chests; he abhors their “stuttering” flutter against his body. The speaker gently resists, citing the blessings of the earthly moment—“Even the shape of your mouth is a miracle”—and her confidence in her own inner mystery. She asks him to “forget the beginning,” to move forward and embrace the real world and its flawed denizens. Split the music, the poem invites, and rediscover the lark. timber wolves announced the moon, bats crept out of the attic. your back, handed you five bucks, and I went to pick up the bats. and went inside and washed my hands and lied to you. Though the poem adopts the perspective of someone wronged, it eschews straightforward victimhood. The readers are not given access to the exact lie of the final line; even in this time of betrayal, the speaker honors the “you” as an audience slightly separate from the rest of us. We are eavesdropping. The poem utilizes risky and swerving contradictions in tone (“You put sugared hands on my neck and kissed my forehead. / No, it happened like this. When you fucked me, I could feel / how much you hated me. And you came. And I came twice”). Many of Rookery’s best poems are branded with these merciless intimacies. On a formal level, Brimhall often uses an indented line in her stanzas. This device has been used to various ends over the last two centuries of American free verse, from William Carlos Williams’s triadic stanza (meant to cue pause and breath) and Marianne Moore’s syllabics (meant to signify parallel counts of beat), to the excesses of Lawrence Ferlinghetti and Frank O’Hara, in which jumping from left-alignment toward the right-hand margin captured acrobatic shifts in attention or literal roaming through space. Contemporary poets such as Henri Cole and David Kirby have associated the indented line with a meditative mode that takes advantage of the traditional line break, plus the additional white space, to counterbalance a loping line of five to six stresses. In many ways, Brimhall is an inheritor of all these influences. But I would add that her indented stanzas have a waterfall quality, as if the speaker is cascading toward a conclusion driven more by instinct or fate than intellect. The verbs that inhabit these indented poems tend to be passive—describing what is known, what is suffered, what is desired, with few fundamental changes in course—and in “Falling,” a tribute to the 146 garment workers killed in the fire at the Triangle Waist Company factory, the form visually and viscerally evokes their helpless plummet. Expanding on Brimhall’s interest in form, this is an explicitly designed book. 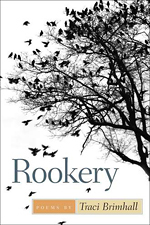 Each section opens with a prosaic play on a definition of “rookery”: from “a colony rooks” or other birds, to “a breeding place,” to “a crowded tenement house.” In addition, poems often are titled as aubades (morning songs, with an additional connotation of parting) or nocturnes (dreamlike songs of evening). This level of structure risks claustrophobia. But it is a strategy of the collection to insist most of these poems are in direct conversation with each other. Otherwise, the lexicon of birds, tongues, crickets, sharks, and other natural symbols could seem casually repetitive. Instead, these icons form the vocabulary of a meta-speaker who, over the course of the collection, stumbles through revelations of motive and fights to comprehend her potential in this lifetime. The final section has the most variety in story, ranging from Longfellow’s loss of his wife to “The Women [who] Are Ordered to Clear the Bodies of Suitors Slain by Ulysses.” Amidst these grim tales we must track the collection’s dark humor, which balances its urgencies. In “A Dead Woman Speaks to Her Resurrectionist,” even the corpse pulled from her grave is granted a moment, in parody of romance, of “your head against my chest, listening to my heart / click with beetles.” Later in the poem, she promises—perhaps taunts—that her dissected heart will yield no answers, only the sound of a cello; “abandoned flesh, the raw shore of paradise.” It is as if the scientist has inherited the blinders of the man who, in the opening poem, decried the “stuttering” of a woman’s lustful, lively body. In Rookery, Traci Brimhall’s poems dart deep into the canyons of the soul and emerge on the other side, bruised, but indomitable. Traci Brimhall is the author of two books of poetry: Our Lady of the Ruins (forthcoming from W. W. Norton & Co.), which won the 2011 Barnard Women Poets Prize, and Rookery (Southern Illinois University Press, 2010), which won the 2009 Crab Orchard Series in Poetry First Book Award. She teaches at Western Michigan University, where she is a doctoral candidate and King/Chávez/Parks Fellow. Three poems by Brimhall appear in this issue of Blackbird.